A few days before Mothers Day, Santa Rosa had a record-breaking 89° so we packed up Friday morning and headed to the coast. I remembered how cold it gets so I brought a parka and a knit cap, but Howard didn’t. 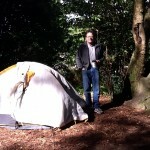 He also did not pack the extra down sleeping bag we often use as a bedspread. It tends to get very cold around dinner time, then as the temperature differential between the inland valleys and the coast dissipates, it warms up by midnight and stays comfortable throughout the night. But warm stews are the best dinner in the cold California summers! I brought homemade lentil soup and Chicken Tagine, a Moroccan stew made with apricots, chickpeas and bulgar. 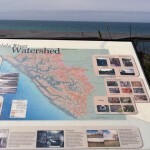 Here is a map of the Gualala River Watershed with the ocean and the mouth of the Gualala River in the background. This is a prime spot for whale watching in February when the mothers come close to the sandbar to scratch off their mussels. 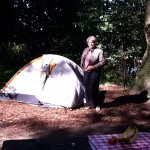 The county campground is small, lovely and has a full-time camp host so it is very well run. We sat in the tent and read, or sat by the river and read. It was great having the campground to ourselves!